We just returned from a brief trip to the South and we were able to do a little treasure hunting for the shop while we were there. We didn’t find the mother lode this time but we did bring back a few very nice pieces that will be going into the shop soon. 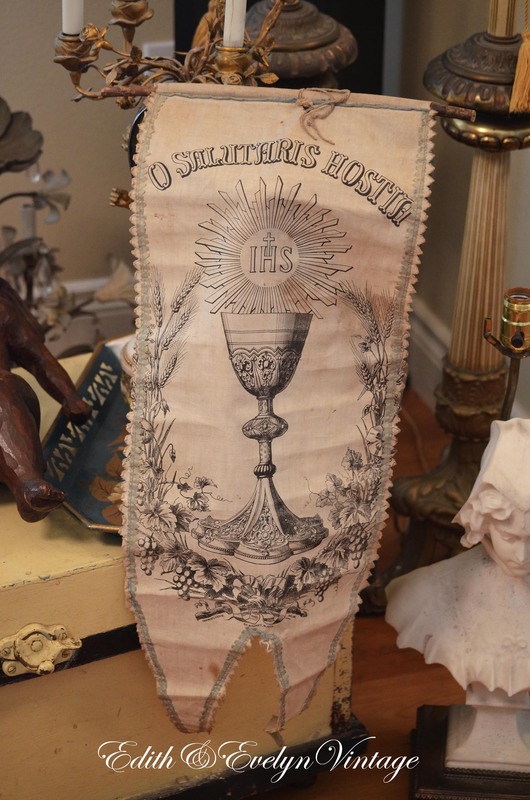 One of the things that I always search for is antique religious pieces and I was thrilled to find several things that fit into that category, including some gorgeous antique Gothic church altar sticks. Known as “prickets”, these are huge and heavy. 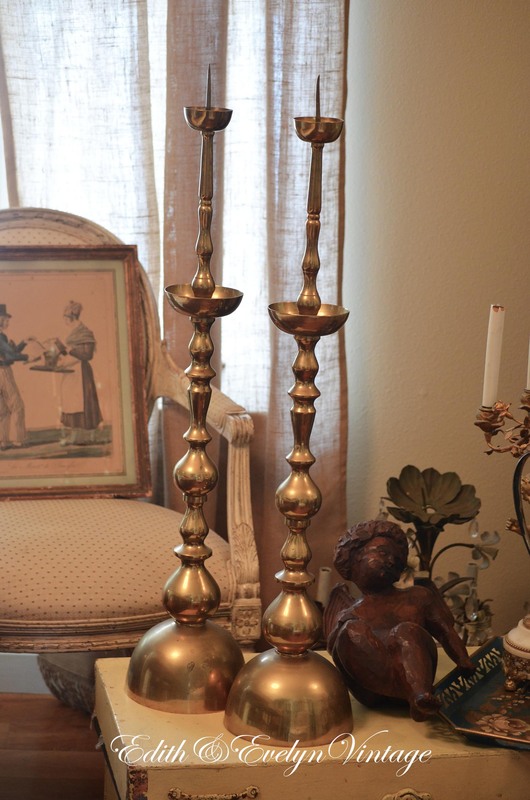 One pair is solid brass, the other pair is from the mid to late 1800’s and have the most beautiful, ornate tripod base. They would be stunning on a mantel or sideboard. I’m going to have a hard time letting them go! Another item that is always on my top 20 “wish list” when out picking is vintage trophies. At one time, they were very plentiful and easy to find, and relatively inexpensive. Interior designers using them in home decor has made them pretty scarce and the prices have gotten high. 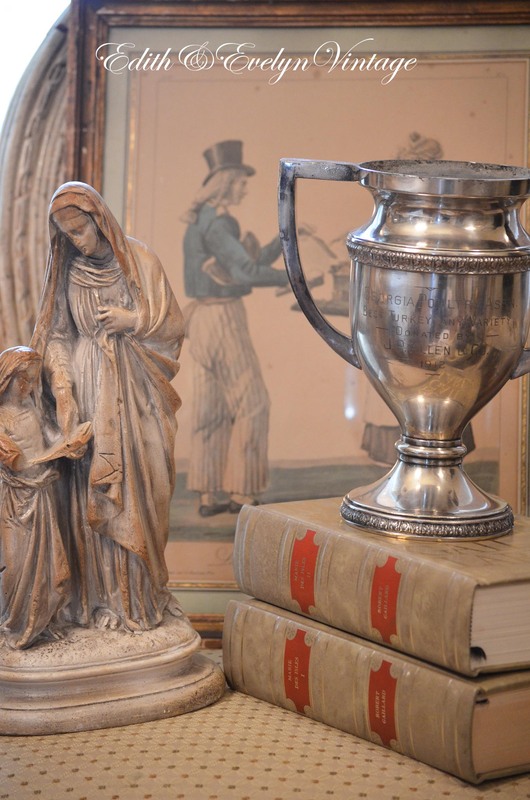 Prices can be determined by subject matter and age and we have found that any kind of farm related trophy cups are much sought after. 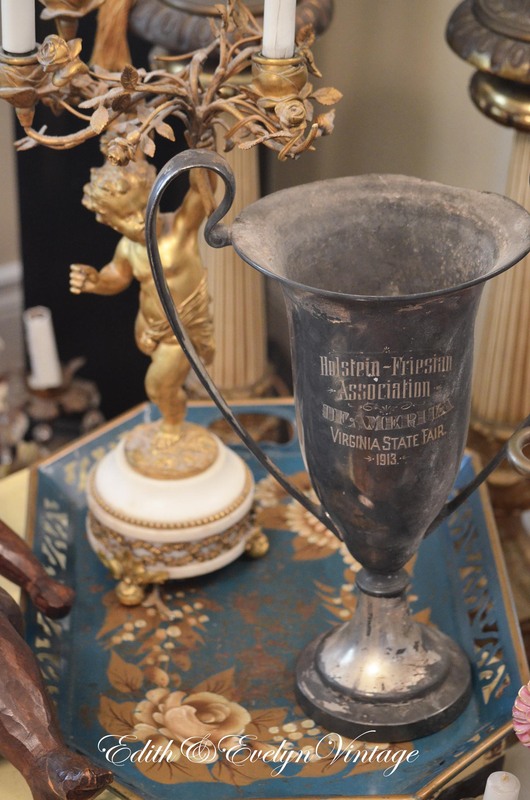 We were so excited when we found two very large trophies, one for “best turkey”, and the other one was awarded at the Virginia State Fair in 1913 by the Holstein & Friesian Association. 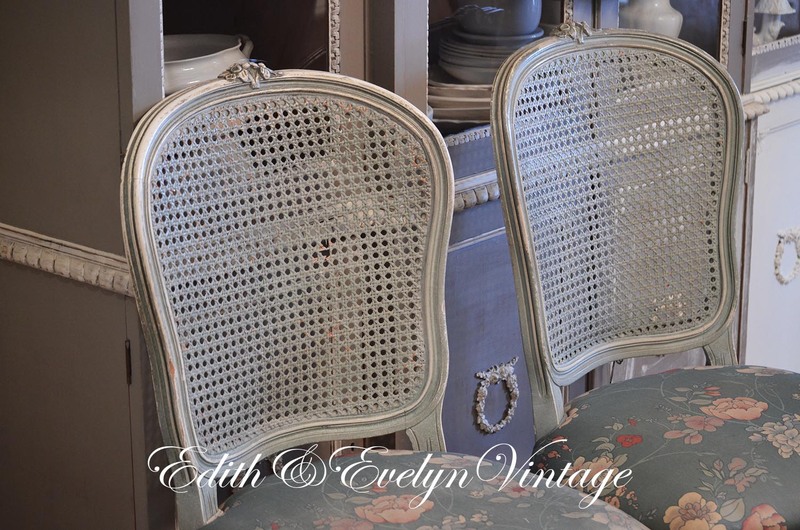 French chairs are always on my list and I was lucky enough to come home with three beauties. Two are cane backed and in very good shape. 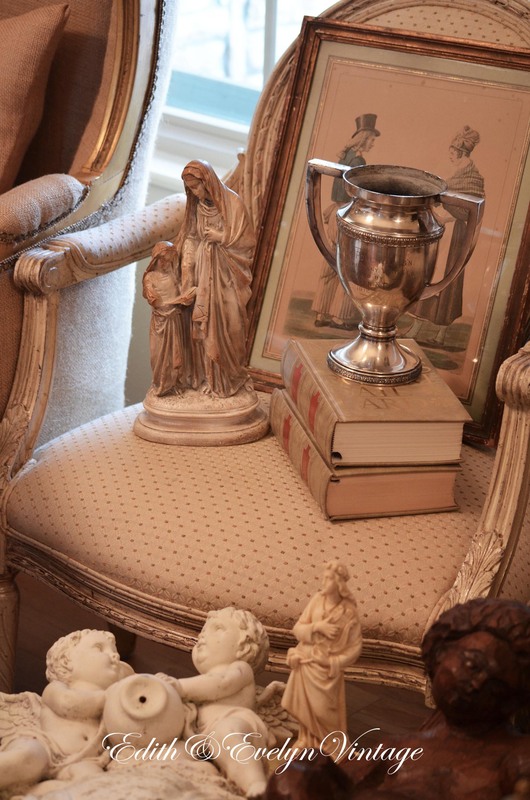 The other is a lovely French arm chair with the original creamy white paint. These three will be staying with me. I have been looking for two more dining chairs and these cane backed chairs will be perfect as soon as I repaint them in ASCP Old White and recover the seats in antique grain sacks to match the other four that I have. The arm chair will get recovered as well and it will be perfect for an extra chair in any room. 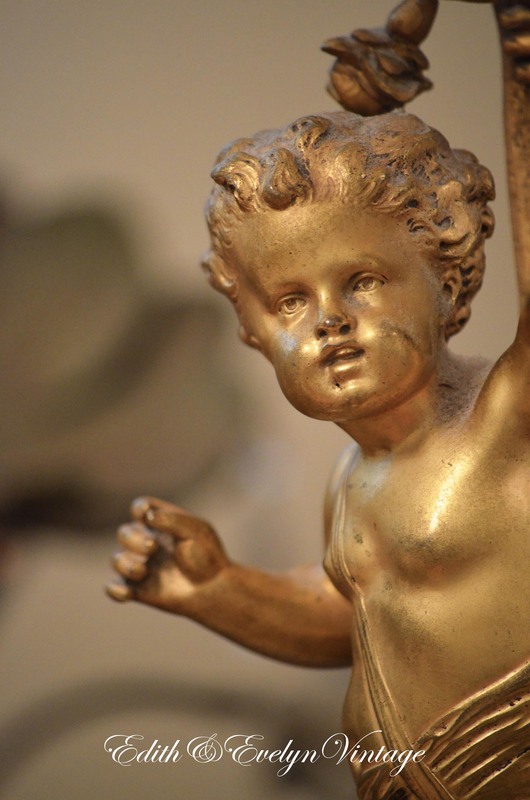 Cherubs are something else that is always on the “search” list. 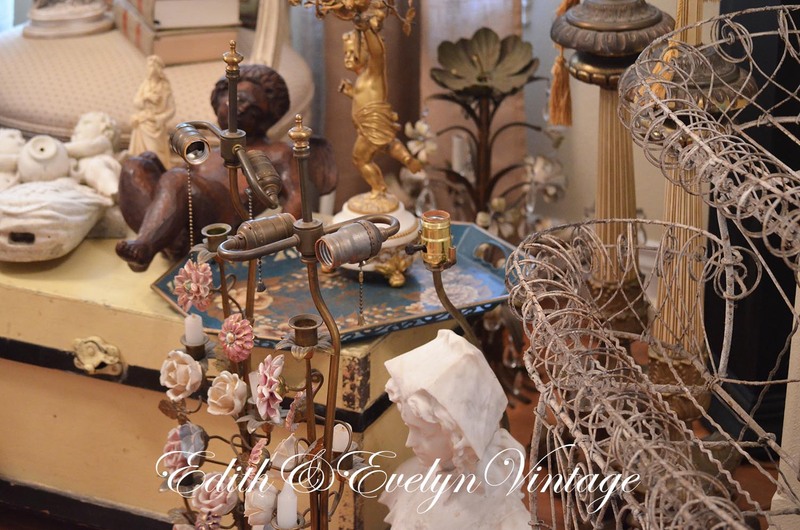 I usually can’t keep anything “cherub” in the shop so I’m constantly looking for vintage stock. 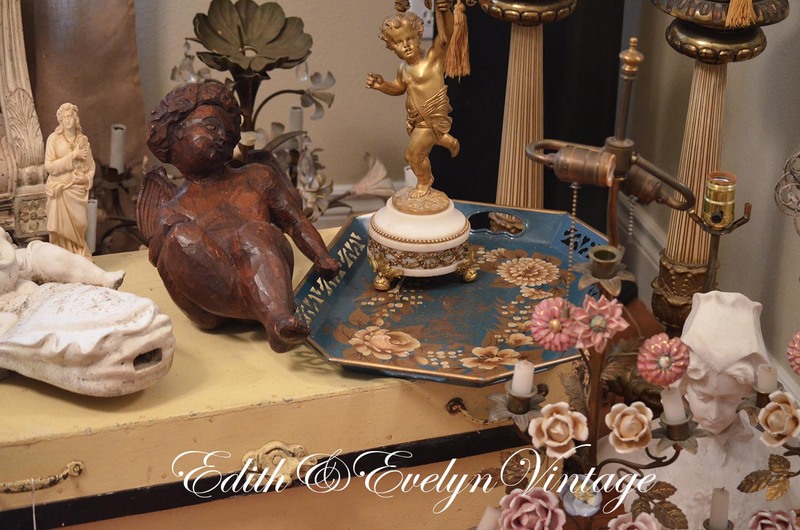 Luckily we found a fantastic old salvaged piece from a wall fountain that features two precious cherubic angels. It would be lovely hung on a garden wall or inside the home. 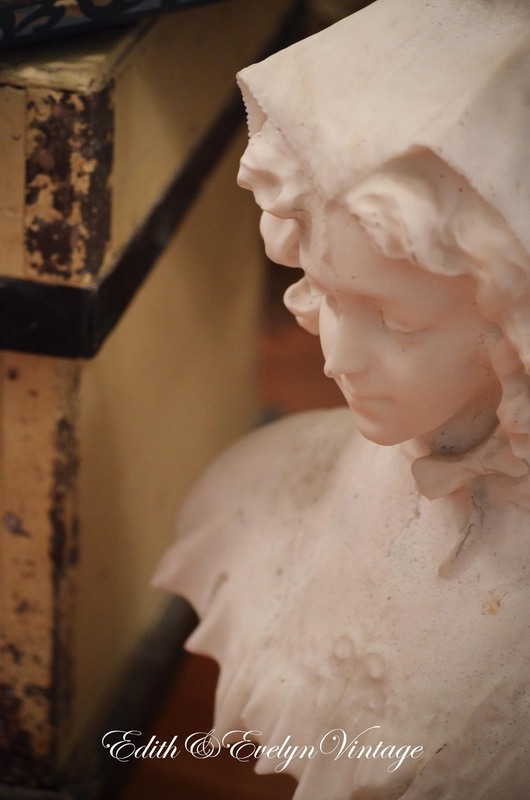 We also found a stunning 1800’s French cherub candelabra (it is gorgeous! ), and a wonderful carved wood putti that is quite large! A pair of spectacular French altar candelabras with porcelain flowers is probably the most exciting treasure that we found. 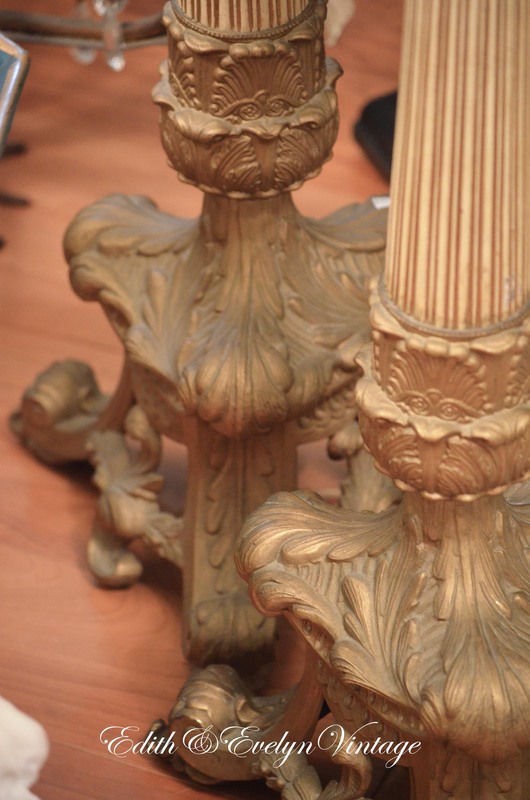 These candelabras once graced the altar of a French church in the late 1800’s. Sometime in the early 1900’s, they were made into lamps. 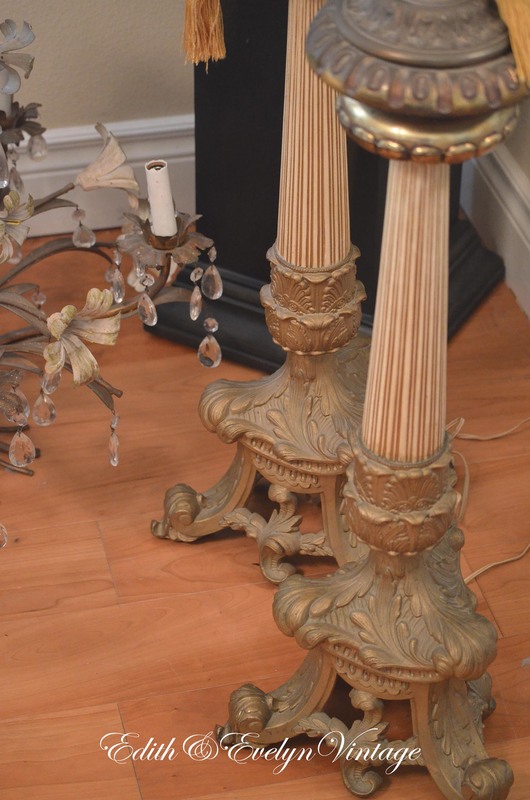 I think I am going to convert them back to their original state of being candelabras before we list them them in the shop, which will be very easy to do. They are very difficult to find and I was a little shocked when I saw them sitting on a table at the estate sale. I couldn’t get to them fast enough! I grabbed them off the table without even looking at the price (which turned out to be very good, thank the Good Lord) and I’m glad I did because as I lifted them off the table, I heard a gentleman behind me say, “Those are what I was coming for.” Oh well…….sorry……..well….not really! 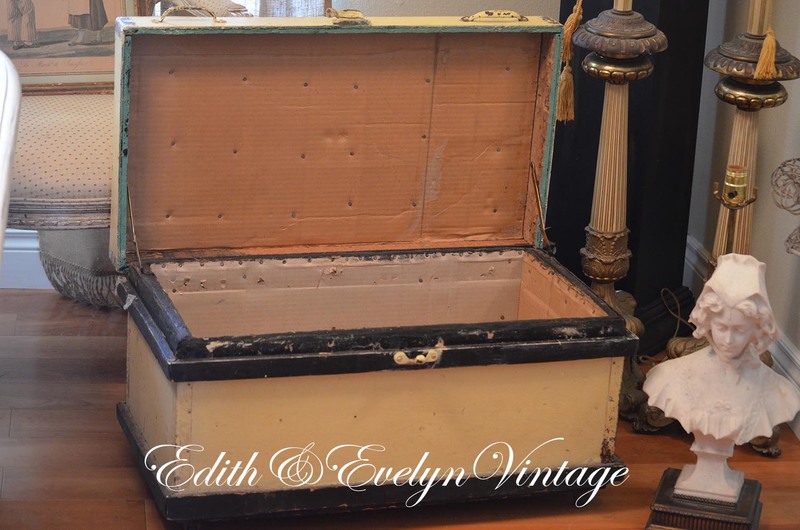 We also found a wonderful old carpenter’s trunk in the original old chippy paint. It has layers and layers of crackling paint on it, the inside is lined with cardboard and it has the most interesting old latch on the front. And it also sports those old antique castors that I love so much! Among the other finds were a beautiful marble French bust of a beautiful lady, a French processional flag that came from Paris, French books, a wonderful framed French print, an Italian tole chandelier with crystal prisms, a lovely blue Italian Florentine tray, and an amazing Victorian garden planter made of wire. 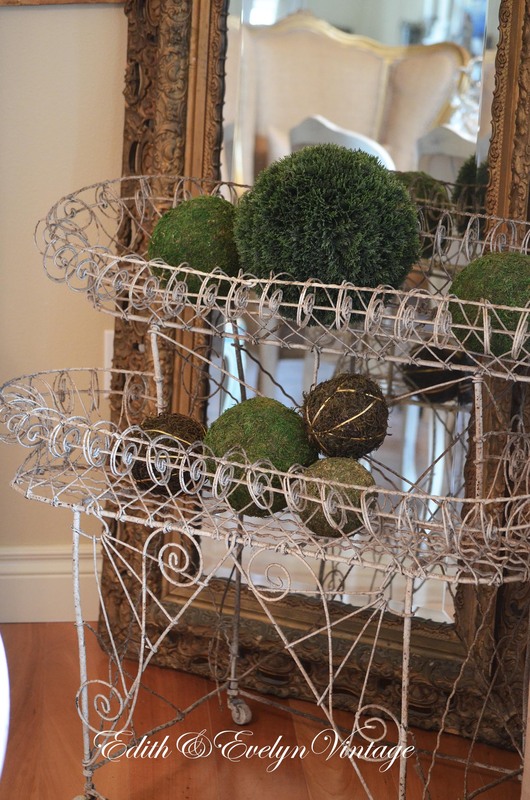 I thought I could sell the Victorian wire planter, but I’m afraid I can’t let this one go, so she will be staying with me along with the French chairs! Sorry, Mr. E&E, I know you hate it when I say things like that! Thank You Vanna! Yes, I will make the pictures bigger…….as soon as I figure out how to do it!! Thank you for commenting Karen! !